Arles Guide: A guide to visit Arles but also Camargue and Provence! Arles is a French city, located in the department of the Bouches-du-Rhône and the area of Provence-Alpes-Côte d'Azur in France. The city is crossed by the Rhône river and is located between Nîmes (27 km in the west) and Marseilles (80 km in the east).It is the largest commune of Metropolitan France. This city, whose inhabitants are called "Arlésiens" in french, has indeed more than 2500 years of history. Remarkable monuments were built during Antiquity at the Roman time, like the Ancient Theatre, the Amphytheater, the Alyscamps or the Roman Circus. Arles a city marked by the history that we will help you discover in this chapter! Quick guide of Arles France: All you need for your Arles journey: city info, transportation, what to do, things to see, where to eat, where to sleep..
Events and Festivals in Arles: From "Les Rencontres d'Arles" to "Les Suds à Arles".. All the main festivals and events in Arles..
Market Day in Arles: There are 2 weekly outdoor markets every week in Arles on Wednesday and Saturday..
Arles History - All about the History of Arles in France from Greek-Phoenicians in the 6th century Bc to today! Arles World Heritage Sites: Arles has important remains of Roman times, which have been listed as World Heritage Sites since 1981. 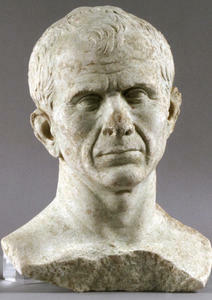 The Julius Caesar bust discovered in Arles: the story the main archaeological discovery in Arles!! Myth of the Arlesian women: About the myth, the costume of the Arlesian women and the French expression.. Famous people in Arles: Frédéric Mistral , Lucien Clergue, Christian Lacroix, The Gipsy Kings are amoung famous people born in or around Arles or related to Arles like Vincent van Gogh..